Imagine you have to post a comment on a forum about the best shopping center in the city. 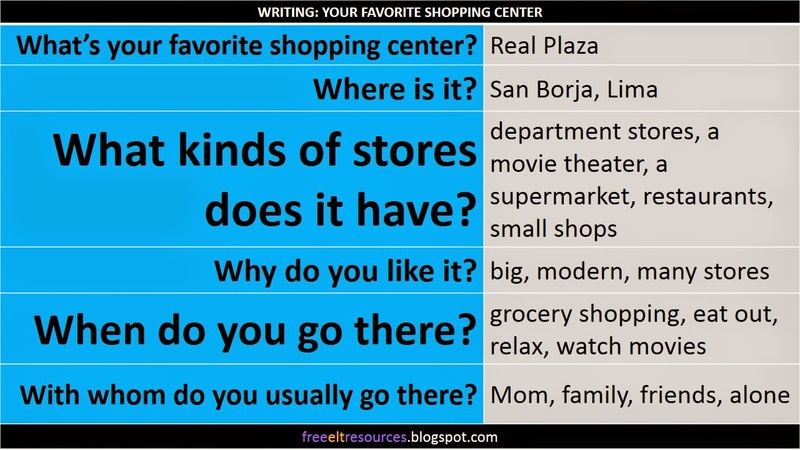 Write a paragraph about your favorite shopping center in your city. / Imagina que tienes que publicar un comentario en un foro sobre el mejor centro comercial en tu ciudad. Escribe un párrafo sobre tu centro comercial favorito. My favorite shopping center is Real Plaza. It is located in San Borja, Lima. It is near my house. I like it because it is big, modern, and has a lot of stores and shops. For example, there are department stores, a movie theater, many restaurants, a lot of small shops, and a big supermarket. My mother and I always do the grocery shopping at the supermarket that is at Real Plaza on Saturdays. If I need to buy clothes and accessories, I can find many shops there and shop around for the best prices. Also, when I am bored and I want to relax, I watch movies at Real Plaza with my friends. The movie theater is modern and comfortable. There are always some good movies to watch. And when Mom is tired and does not want to cook, we have chicken at Pardo's. They have the best chicken in Lima. I just love Real Plaza! ¿Qué se puede resaltar del párrafo modelo en cuanto a la estructura de sus oraciones? Se usa bien el "simple present " para hablar de "facts", es decir, información que es verdadera sobre un asunto; y para dar una opinión de algo en el presente. It is located in San Borja. / Está ubicado en San Borja. It is big, modern, and has a lot of stores and shops. / Es grande, moderno y tiene muchos establecimientos y tiendas. It is near my house. / Está cerca de mi casa. There are department stores, a movie theater, many restaurants, a lot of small shops, and a big supermarket. / Hay tiendas por departamentos, un cine, varios restaurantes, muchas tiendas y un supermercado grande. I can find many shops there. / Yo puedo encontrar varias tiendas allí. The movie theater is modern and comfortable. / El cine es moderno y cómodo. There are always some good movies to watch. / Siempre hay algunas películas buenas que ver. They have the best chicken in Lima. / Ellos tienen el mejor pollo en Lima. I just love Real Plaza! / ¡Me encanta Real Plaza! Se usa bien el "simple present" para hablar de qué sueles hacer dependiendo de cómo te sientes. Also, when I am bored and I want to relax, I watch movies at Real Plaza with my friends. / También, cuando yo estoy aburrido y me quiero relajar, yo veo películas en Real Plaza con mis amigos. And when Mom is tired and does not want to cook, we have chicken at Pardo's. / Y cuando mi mamá está cansada y no quiere cocinar, nosotros vamos a servirnos pollo a Pardo's. Se usan bien los "quantifiers", es decir, "a lot of, many, and some" para hablar de cantidades. El siguiente cuadro muestra cómo juntar tus propias ideas antes de escribir un párrafo como el del ejemplo.